Global compounding pharmacies market expected to generate revenue of around USD 13,910.0 million by end of 2024, growing at a CAGR of around 6.2% between 2018 and 2024. Every patient is different and has unique needs for which customized medications are a critical part of quality medical service and patient care. The report covers the forecast and analysis for the compounding pharmacies market on a global and regional level. The study provides historic data for 2016 and 2017 along with a forecast from 2018 to 2024 based on revenue (USD Million). The study includes drivers and restraints for the compounding pharmacies market along with the impact they have on the demand over the forecast period. Additionally, the report includes the study of opportunities available in the compounding pharmacies market on a global level. In order to give the users of this report a comprehensive view of the compounding pharmacies market, we have included competitive landscape and analysis of Porter’s Five Forces model for the market. The study encompasses a market attractiveness analysis, wherein the product type segment, therapeutic segment, and end-user segments are benchmarked based on their market size, growth rate, and general attractiveness. 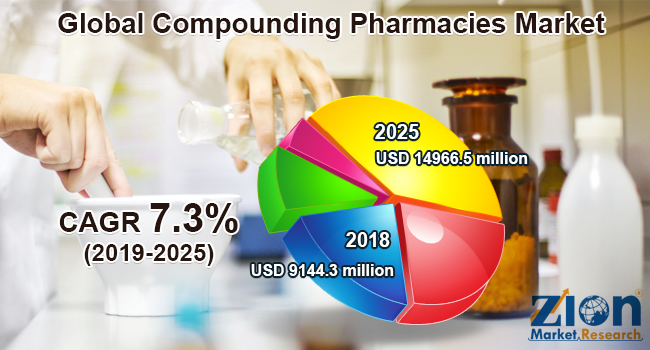 The study provides a decisive view of the compounding pharmacies market by segmenting the market based on product type, therapeutic type, end-users, and regions. All the segments have been analyzed based on present and future trends and the market is estimated from 2018 to 2024. Based on product type, the market is segmented into oral, topical, mouthwashes, suppositories, injectables, and ophthalmic. Based on the therapeutic type, the market is segmented into hormone replacement and pain management category. The end-users are classified into an adult, pediatric, geriatric, and veterinary. The regional segmentation includes the current and forecast demand for North America, Europe, Asia Pacific, Latin America, and the Middle East & Africa with its further division into major countries including the U.S., Rest of North America, the U.K., Germany, France, Italy, Spain, Rest of Europe, China, Japan, India, southeast Asia, Rest of Asia Pacific, Brazil, Rest of Latin America, GCC Countries, South Africa, and Rest of the Middle East and Africa. This segmentation includes demand for compounding pharmacies market based on individual product type, therapeutic type, and end-users in all the regions and countries. The report also includes detailed profiles of end players such as AmerisourceBergen, Rx3 Pharmacy, Agbi’s Sterile Compounding Pharmacy LLC, B. Braun Medical Inc., Cantrell Drug Company, Inc., Belle Sante Diagnostic & Therapeutic Institute Pvt. Ltd., Village Sterile Compounding Pharmacy, Imprimis Pharmaceuticals, Inc., Institutional Pharmacies Of Louisiana LLC, Lorraine's Pharmacy, McGuff Sterile Compounding Pharmacy Services, Inc., Panaceutics Inc., Pencol Compounding Pharmacy, Fagron, ITC Compounding Pharmacy, SCA Pharmaceuticals, Wedgewood Pharmacy, Fresenius Kabi AG, and Dougherty's Holdings, Inc.